Over the course of history people spontaneously and consciously have been selecting the best dogs, the cleverest, the bravest, the most devoted, the strongest, the most resilient helpers for work. The main selection criterion did not lye in the looks of a dog, but in its adequacy for particular work. As a result of rapid technological expansion, urbanization of society people less and less need a dog as a helper, and bygone workers such as gate-keepers, shepherds, hunters are turning into decorative pets. The wonderful working breeds degrade and only the breeders and owners can put an end to this process. At management under the urban conditions the best thing, you can do for your dog — is to carry on sport training. In such case your pet will be obedient, physically healthy, mentally well-balanced, and sport will do a power of good to you. You will be able to bring out the best qualities in the dog inherent in the very nature and enrich them. You will experience a new fascinating sport available to people of any age group. The dogs of the breeding kennel mandatory undergo the course of obedience (BDT, BH), and thereafter the protection course (IPO system elements). BDT — basic dog training. BH — a companion dog (German Begleithund). 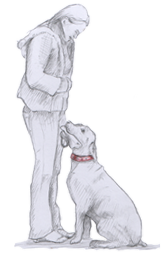 IPO — International service dog trial rules (German Internationale Pruefungsordnung).